I have a lot of books. That may be an understatement. As a child, I lived in a remote country town with very few shops, but what it did have was a church with an attached Opportunity Shop, known to Australians as an ‘Op Shop’. I believe the United States calls them Thrift Stores or Charity Stores. This is where everybody brought their unwanted goods which were placed for sale at low prices, the proceeds going to the church. You could buy old books at this Op Shop for five cents each. The price of two icy-poles. The books were usually 1860-1880 editions, but sometimes I’d get lucky and find older ones. This is how I obtained my collection of Christian ladies’ magazines. I read those books from cover to cover, they were my time machine into an earlier age. Being in a tiny rural town it was easy to be transported in this way. We didn’t have traffic sounds to break the spell, 1940’s motor vehicles driven by elderly men in hats were still common, fashion didn’t really impinge on practicality. I read ‘The Secret Garden’ in a very early edition, many years before it reached public domain and was publicly reintroduced. I read ‘The Fairchild Family’, the E Nesbit books, several Walter Scotts, Tom Brown’s School Days… whatever came my way. My mother loves to read too, and it was she who first taught me to open a book and read the inside cover and the pre-contents pages. Those pages tell a story of their own. Sometimes the book has a dedication, by the giver to the recipient. There is always the name of the publisher and the printer. These books came from before the dust jacket era, and generally there was no summary of contents to be found. I learned to estimate the contents from the publisher, to estimate the audience from the style of book. Is it ornate, and does it have large decorated letters to start each chapter? It is probably for the entertainment of the wealthier families, who expect a good dollop of respectable edification. Is it so small the print can hardly be seen and not an illustration in sight? It’s a well known, well advertised work reproduced for poor people. Is it well bound by a known publisher with a preface by a professor, but with few illustrations or embellishment? Most likely it is a textbook for a gentleman’s school. I’m an absolute sucker for a book with a name scribbled inside, or a little gift sticker announcing that it was a school prize. I have heaps of these. Nowadays I have storage problems and I hope to locate the families they came from so I can hopefully give them back. Yes, when I see a name in a book I research that name, to see if I can learn who they were.. These were the names of fellow readers who had read the same books as I. 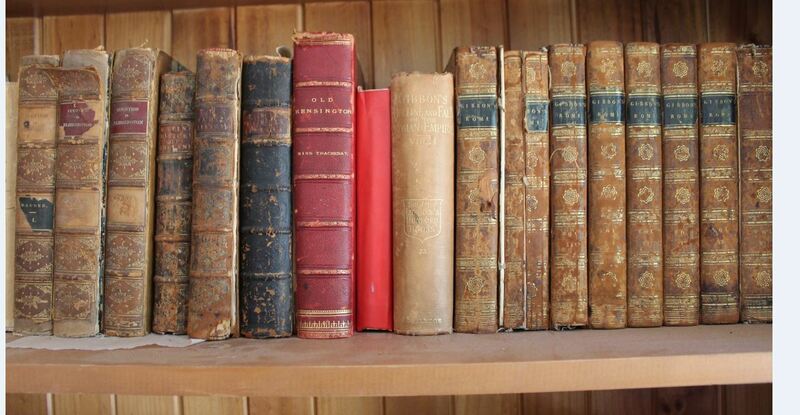 Our family is not without it’s favourite books, passed down from generation to generation. 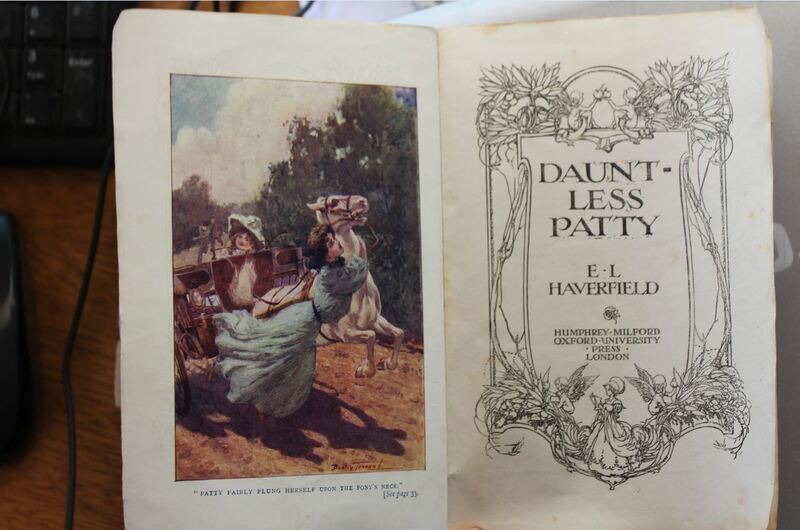 We have one in particular – a rather battered little book with a plain red cover titled Dauntless Patty. It’s a school story set in the opening years of the 20th century about a girl from Australia who is sent to England to attend boarding school with her dainty English cousin. The book first belonged to my grandmother Peard, and she brought it to Mannus where my mother read it and enjoyed it. I read it as a child too, in fact I’ve read it more than once. In recent years, I talked my own daughter into reading it. The book is not really in a condition to read any more, I’ll have to find a reprint for any further generations to read. I recently read a review of this book by someone who was not at all taken by it. We liked it though. My oldest book with a dedication is the 1727 translated edition of Paul de Rapin’s History of England Vol II. It was awarded as a prize in 1739 to Kildare Borrowes, quite likely, I think, to be a relation of the family of Baronets in Kildare. In fact, the 5th Baronet Kildare Burrowes was born in 1722 and maybe this book was a prize to him? Yet here it is in my house in South Australia, some three hundred years later. I could go on and on. I have many many books and today I am checking them for signs of damage. Most are kept packed away from insects and light since we moved to bright, hot South Australia. Just to finish, I feel the need to represent my paternal side of the family. Most sides were illiterate when they arrived in Australia but they still enjoyed their books. Times were tough and they didn’t have the chance for much education. 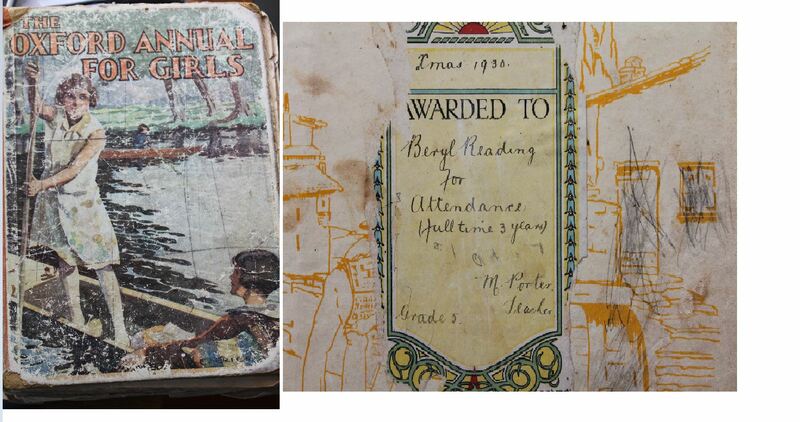 Here is a book awarded to my father’s mother upon completion of three years at school without a day off. She only attended school for four years in total, and lived in conditions of dire poverty. Her father was very elderly and unable to work, so my grandmother’s attendance was a real accomplishment. My grandmother, Beryl Reading, received this award at Christmas 1936 and kept the book her whole life. She gave it to me in her later years, and I’m very glad of it as the majority of her things ended up on the tip.